This sermon was preached at the Unitarian Universalist Fellowship in Huntington on 4/19/15. It reflects on the spiritual implication of optical illusions. We often talk about open mindedness as a virtue that allows us to see new possibilities, or to reduce conflict; to live and let live or to agree to disagree. The spiritual discipline here is in not finding ourselves falling for the trap of over-identifying with our ego as we define ourselves with our stance. When we get worked up over inconsequential things, because the differences feel like they are threatening who we are as a person, we know we’re going down that useless path. It’s a path we all go down often enough to keep it well trod. Those fights that quickly go to “you said” and are followed with “but you said” might be good examples. But I want to look at openness this week more fully from the perspective of actual, inherent difference. When perception and reality may come up with really different answers. Or when two different perceptions of reality, even when in direct opposition, may both be correct. This type really unnerves us. Like we briefly spoke about a month or so ago, with the blue/black or white/gold dress, in a certain lighting people factually see it differently. Imagine dividing this room up by the blue/black viewers on one side, and the white/gold viewers on the other and requiring us to argue which is right. It would be a fruitless exercise in futility. I think this particular image was so shocking to so many of us because it’s hard to accept that we may biologically see color or lighting very differently. The challenges to the simple truths in life may be the hardest to accept. There’s nothing complicated about this image, but we come to very different interpretations that are visually irreconcilable. Often images get translated through the story we bring to the viewing. Just this past week, for those of us on social media, we’ve seen this image of all over the place. The cat begs the question, “is the cat going up the steps or down the steps?” On one level, it’s a cute optical illusion. It’s just lines on paper, or possible a 2D photo of an event. Do we put ourselves at the bottom of the steps looking up, or at the top of the steps looking down? It seems like an innocuous question, but how often is that exactly what we do in life? Every time we hear or see something that affects our lives, we choose, consciously or unconsciously, how to interpret our relation to it. When adversity or success comes our way, do we view it as if we’re at the top of our proverbial steps, or at the bottom? Our sense of hardship or ease often colors which angle we take, and it’s understandable, but not always helpful or healing. I remember when I was in the start of my ministry, right after seminary, single and heavily indebted by two graduate degrees. I was living in an attic, in a Brooklyn home whose owners were a family with two teenage youth. My room was directly above their teen’s bedroom. I recall being worried at the time that if I didn’t get a wedding officiant job every month, my salary was no going to be enough to pay the rent. 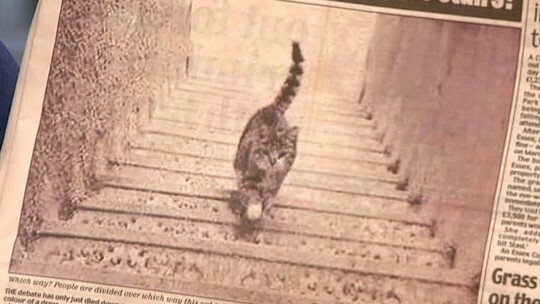 For me, at that time, I walked around acting as though I was at the bottom of those steps and looking up at a cat walking down. But I had a roof over my head, food to eat, a ton of friends who lived nearby, and the achievement of having had access to graduate education that allowed me to follow my dreams. For much of the world, folks might have seen all that as living at the top of the steps. It doesn’t change the nature of any challenges we face. Life can be difficult, and we can feel like it’s too much for us to handle, and from another perspective we might also be rather fortunate. Perception versus reality. Aside from the extreme sources of sorrow in the world, where words fail us utterly, we have some ability to choose to feel like we’re at the top of the stairs. And we often can choose to feel like we’re at the bottom, even when we’re not. Sometimes the difficulty is not quite as deep as we think. ledge, with the dynamic duo scaling the walls to save him. We all can find ourselves trapped in this way. Our imaginations can fill in lines to turn solid ground into vertigo-inducing pits. I think sometimes, we can even find some sense of satisfaction in seeing danger or anxiety where there is none. 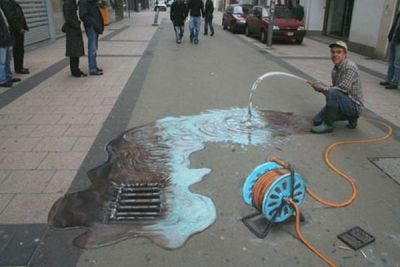 Like the cute sidewalk chalk drawing, seeing the story the way we are accustomed to has some satisfaction to it, even if we know it’s not really as it seems. It’s another trapping of the ego. When our sense of self becomes identified with whatever difficulty is before us, after time that sense of self can feel at risk if the problem goes away. It’s the classic story of the person lamenting that no one will ever love them, but who passes up every person who’s interested for one reason or another. I’d guess many of us have been there at some point in our lives. Or remember the even more universal story from our teen years where we thought everyone else around us was secure in their bodies and their lives, everyone but ourselves. Ha! That was some optical illusion we bought into – and the negative story that creates changes how we live into so many of our moments. We’re creatures of story. (queue hosepipe photo) This photo is another story. We see a bunch of lines on the ground, in color and chalk, and we put ourselves into it. We invent the water, we invent the hose, we pretend the fellow is holding the nozzle and that water is in the air. We do this because we understand the world through story. Humans are meaning makers, and from that truth, we understand the world. It doesn’t mean that life is devoid of actual meaning. I think that by virtue of living, we’ve earned an opinion on what’s going on; so we shouldn’t discredit the stories we come up with. They’re our stories and they have value. But when we live into the fantasies that cause us harm or grief – like the fantasy that as a teen we were the only ones uncomfortable with our bodies, or any adult version of the same – those fantasies never go away right – when we live into those fantasies we allow our gift to find and create meaning to turn into a curse. We take one of our greatest gifts as human beings and make it something foul; and we can choose to do that. Sometimes we might both be telling the same story, but come to another conclusion. (queue concrete grasshopper). Now look at this young girl. 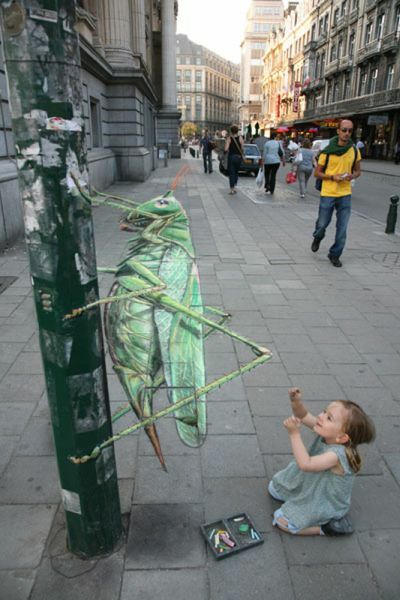 She is clearly overjoyed with the wonder of the image of a giant grasshopper hanging out on the city post. She’s getting into the picture herself and bringing life to a city street where everyone else is blithely walking by from one place to another. (It’s a simple miracle that no one is on a cell phone in the background.) Now, if I ever encountered a grasshopper that was twice my size, a look of wonder and joy would not be found anywhere in the vicinity of my face. But that girl is choosing to take part in another story. And she’s right; it is a bit of wonder and magic amidst the everyday. We can sometimes choose to find it, even in places where we might be a little afraid of its newness or difference. I’d like to share one last optical illusion. This one is thanks to our music director, Richard. He was telling me a story of a time he was in a FedEx store and talking with an employee who had worked there for 20 years. He asked them if they saw the symbol in the image. They responded, “what symbol?” I confess, when Richard asked me the same, I didn’t see it at first, it took me a moment to find it. Do you see it?… It’s between the letters E and X. FedEx’s professional marketers drew the letters in such a way that there’s a subtle image of an arrow going to the right between the E and the X. You don’t see it at first, but it’s dances around our subconscious; it’s impact on our sense of who FedEx is, runs wild without our conscious awareness. This type of optical illusion is a bit different than the rest. We’re not easily seeing what is hidden before us, but the message still affects us in subtle or sometimes obvious ways. What stories in our lives surround us, and affect us, whether we’re conscious of them or not? What are the subtle but persistent stories that frame our lives and our choices? Peer pressure, shame for things we may have no control over, systems that direct certain people to certain places, the internal monologues of doubt, and insecurity, and helplessness. Where has someone told us along the way that X was possible and Y was not, and we chose to buy that map? The virtue of trust is something we’re reflecting on all month, and it’s a kind of heart/mind/soul… muscle… that we would do well to flex from time to time, or maybe a muscle to stretch from time to time. What do we place our trust in? Do we place our trust in the well-crafted subtle or hidden messages that tug and pull on our minds and choices? Do we place trust in the meaning we choose to create for ourselves? Are we open to possibility, or do we maintain our sense of openness solely to that which has come before – good or bad? Do we find all the optical illusions before us (metaphorical or literal) and focus on how they can trick us? Do we focus on how they can open up a sense of wonder? Or do we learn to trust in our capacity to perceive, judge and direct our sense of what’s before us; owning the places where we do have control, and being gentle with the places where our senses slip from edge to depth? There are countless angles to approach whatever is before us, and often the way we come upon something new or different is just as critically affected by the eyes we bring to it. My faith as a Unitarian Universalist is grounded in open mindedness because we often know, but we don’t always know, and sometimes knowing is only part of the matter at the center of our hearts.